Home Celebs 2Baba Surprises Wife On Their Wedding Anniversary!! 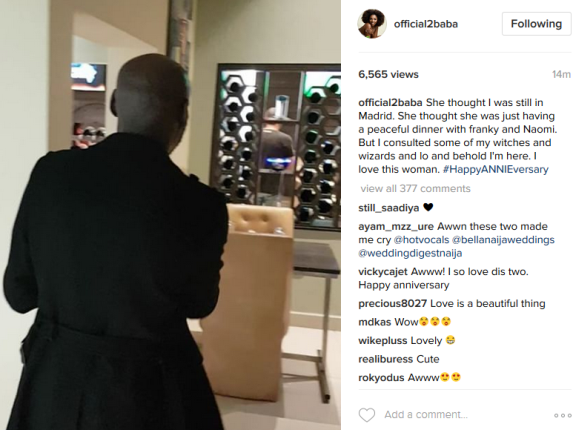 2Baba Surprises Wife On Their Wedding Anniversary!! In order to prove his undying love for his wife, 2Baba who is supposed to be in Marid, flew back to spend the special day with his wife, who was not aware he was in town. Annie thought 2face was still in Spain and was totally surprised when he snuck up on her while she was out having dinner with friends. Wishing them forever and a day more! Today is the couple's wedding anniversary and 2face made a special video for her.